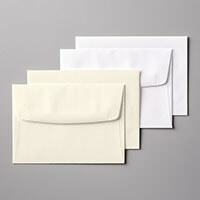 So glad you’re back for part 2 of my favorite embossed note cards! If you missed the first part of this project, including the directions and tips, see it HERE. Today, I’m sharing the details on six of my favorite Textured Impressions Embossing Folders (TIEF) with a close-up of the beautiful note cards they make. 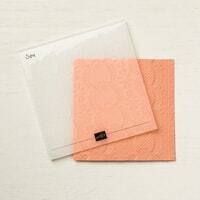 Let’s start with the new LACE Dynamic TIEF found in the Spring Occasions Catalog (page 11). Can you believe that gorgeous detail? I opted to only emboss a small part of the folder, but that’s part of the versatility of the larger 6″ x 6″ folders; choose either horizontal or vertical orientations. 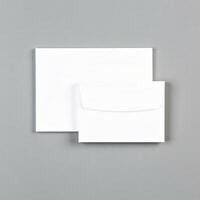 For another option and even more value, reverse the note card and get a similar, but different look from the back-side! The card above features the PETAL PAIR TIEF. Like the name indicates, this is one of a pair of folders you get with this set. 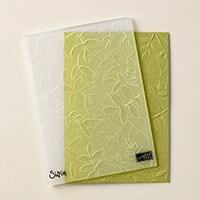 It’s a small slender embossing folder, so it gets high marks for being able to add a touch of texture in select spots. I use this one a lot layered under sentiments and focal points on cards. See an example HERE. It’s also fun and easy to color with Sponge Daubers- see what I mean HERE (you’ll also see a card embossed with the second folder). The above card shows the embossed (raised) side. The card below shows the de-bossed side. It’s not nearly as evident on camera as it is in person, but, it really does create a different ‘feel’. The beautiful QUILT TOP TIEF is responsible for all that lovely stitching on the cards above. This TIEF is great for adding texture to backgrounds. 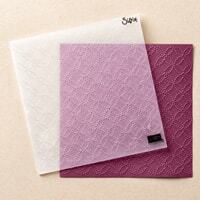 Over Designer Paper, it gives the look of quilting! That “lovely” card above uses the LOVELY FLORAL Dynamic TIEF. It creates that large single embossed floral image that makes for a stunning focal point. It works equally well creating texture and dimension under other layers, like you’ll see in these customer thank you cards HERE. I wanted to try something different on the card above, so I clipped the corners off with the Everyday Label Punch. Easy-peasy… give it a try! Isn’t the TUFTED Dynamic-TIEF adorable? Depending on what you use it with, it can take on different “looks”. It’s lovely for adding texture and dimension to wedding or baby projects- or as a lovely background for anything. I added a strip of 3/8″ Pool Party Shimmer Ribbon (attached with SNAIL adhesive) and bow (attached with a Mini Glue Dot) for a sweet (shimmery) finishing touch. I’ve saved one of personal favorites for last: The Layered Leaves Dynamic-TIEF. Look closely- can you see how the leaves vary in depth? 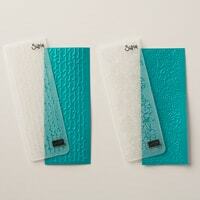 This ‘dynamic’ folder is able to achieve that stunning texture because of the thickness of the embossing folder. It looks fabulous as a background, like on this sympathy card or on my daughter’s birthday card. If you don’t have this one, I highly recommend it! 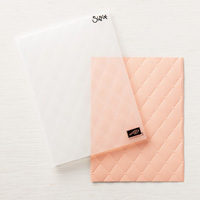 These six are my favorites for handmade note cards, but there’s still 24 other embossing folders to choose from! Some of those qualify as my favorites for backgrounds, but that’s for another day. See why it needed to be a 2-part post? If you like these cards, you may also enjoy this video tutorial on how to take your embossing up a notch. 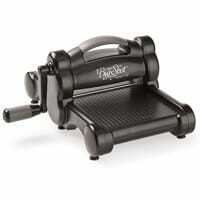 It’s so easy & fun… and a little addicting! Not only do I use these cards often, but also I love to gift them in sets to friends and family. They always respond with awe and amazement that I made them. Having the right tools makes all the difference- it really does all the work for you (but, they don’t need to know that-lol)! Make sure to see Part 1 for why NOW is the BEST TIME to get the Big Shot Machine (one of the three things you need)! Also included are the tutorial with tips and a video on the Big Shot in action. 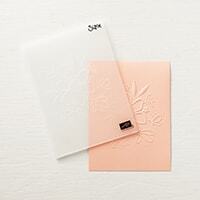 Want to make these Handmade Note Cards? YOU CAN! lace tief, layered leaves tief, lovely floral tief, notecards, petal pair, quilt top tief, tufted tief. Bookmark. Love, Love, LOVE!! So Simple yet Gorgeous!!!!! Good Morning Tammy, I’m here from Mary Fish’s Sunday Parade of cards. These are gorgeous and just what I needed for today. Clean and simple, so easy, and no stamping, but impactful. I’m going to get out a pack of notecards and see what happens. Thanks for sharing.